Digital tire pressure gauge. Adjust and measure the tire pressure with a range of 7BAR/101PSI with high accuracy of 0,1% over the full scale. It has been designed for the Racing World where tire pressure is primary for the performance of the tires. With Hiprema 3 EVO you measure the pressure without errors. This digital tire pressure gauge does not require calibration; whenever you switch on it the internal microprocessor automatically performs the procedure in order to reach a reliable measure at 100%. NEW Design Tire Pressure Gauge - Great looking new graphics - includes both angle and ball chucks. 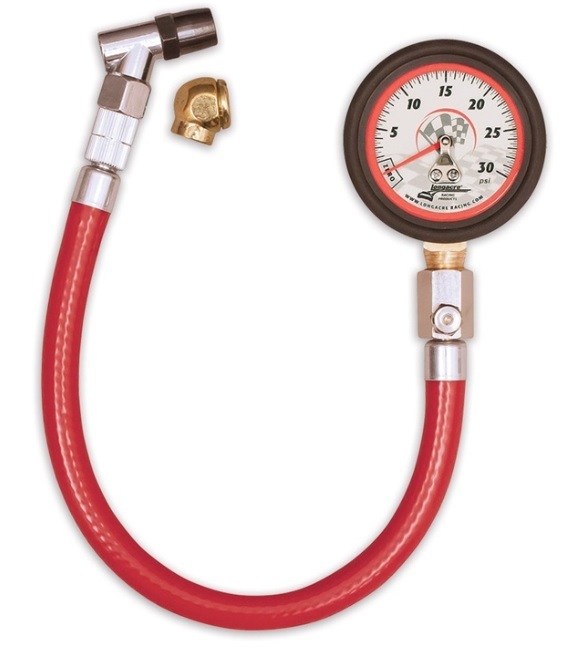 Air pressure release button, Internal gauge damper for more accurate readings and longer life, Flexible 14" hose with angle chuck installed - also includes ball chuck, 2" Glow-In-The-Dark dial face. Digital tire gauge from Alfano with memory for 2-4 wheels, saves hot/cold pressures and measures in Bar and PSI. Typical high quality gauge from Alfano! Digital tire gauge from Alfano. Meaures tire temperature, memory for 2-4 wheels, saves hot/cold pressures and measures in Bar and PSI. Typical high quality gauge from Alfano!